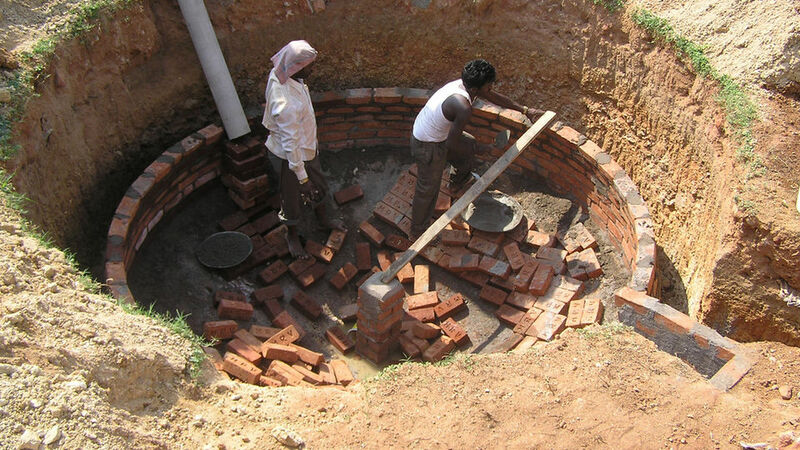 SKG Sangha uses local masons to build a biogas plant in Bidadi, South India. The rural population in the state of Karnataka rely mainly on fuelwood for cooking, using it on smoky open fires and stoves. Wood is traditionally collected from common land, but pressure on land is making it increasingly scarce. 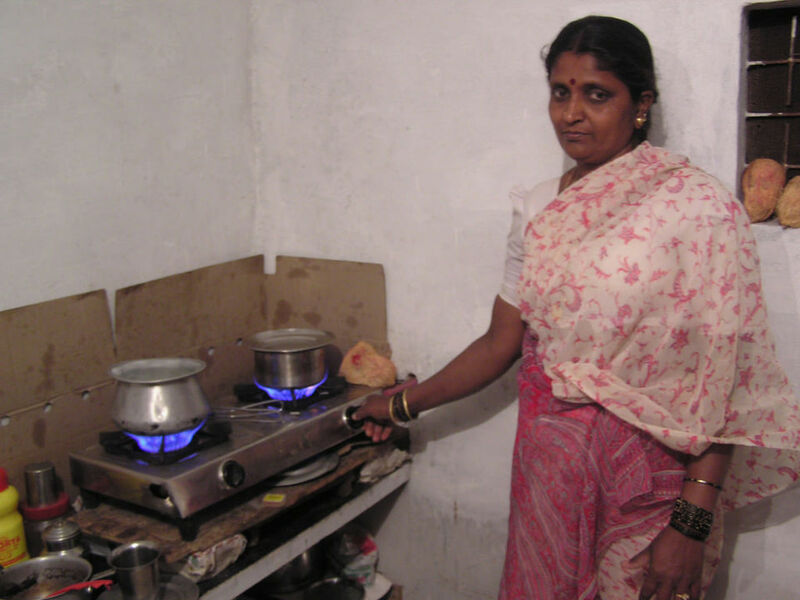 The 2007 Ashden Award to SKG Sangha (SKGS) recognised their achievement in supplying biogas plants to large numbers of households to replace the use of fuelwood. Although the state of Karnataka in southern India has thriving, affluent cities such as Bangalore, most of the rural population are subsistence farmers, growing rice, millet, vegetables and coconuts in the monsoon-watered land. Sale of any surplus food crops, together with cash crops such as betel nuts, spices and tobacco, give a typical household income of only about US$320 (Rs 14,000) per year. The main fuel for cooking is fuelwood, used on smoky open fires and stoves. Wood is traditionally collected from common land, but pressure on land is making it increasingly scarce. The biogas programme of SKG Sangha was set up to replace fuelwood with biogas for cooking, and also to increase household income by making a saleable fertiliser from biogas residue and other unmanaged agricultural organic waste. SKG Sangha is a not-for-profit organisation, founded in 1993 by D Vidya Sagar to provide opportunities for economic growth and development in rural areas of South India, in particular through using renewable energy. As well as the biogas programme, SKG Sangha provides improved biomass cooking stoves, rainwater harvesting systems, and solar electric lighting systems. The organisation has grown rapidly, with turnover increasing from US$0.42 million in 2005/06 to US$3.8 million in 2008/09. In 2009, SKG Sangha was employing 1,100 people, with 1,600 working indirectly for the organisation. 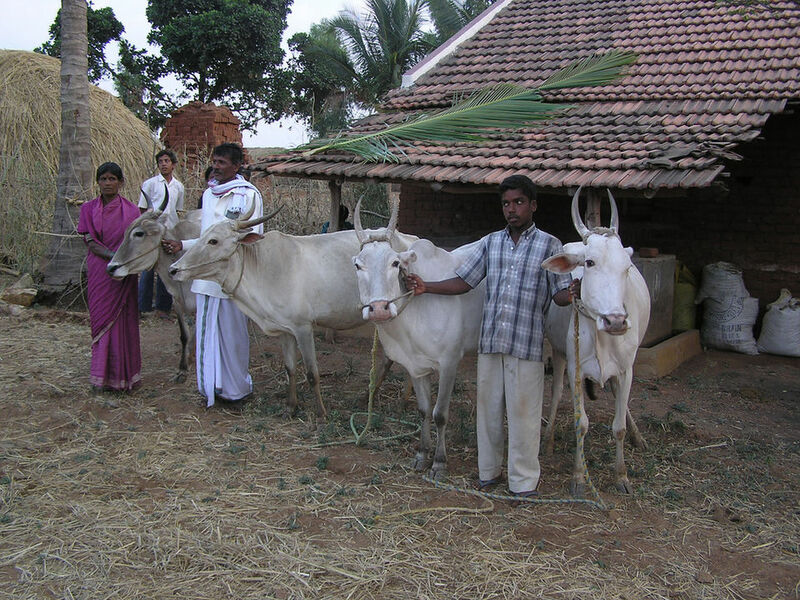 Livestock are a source of clean fuel and income from vermicompost in rural Karnataka. Biogas systems take organic material such as animal dung and kitchen waste into an air-tight tank, where bacteria break down the material and release biogas – a mixture of mainly methane with some carbon dioxide. The biogas can be burned as a fuel, for cooking or other purposes, and the solid residue can be used as organic compost. The biogas systems made by SKG Sangha are of the well-established Deenbandhu design, and use an underground brick-built digester vessel. A typical 3 cubic metre plant costs about US$380 (Rs 16,340). The national, district and local governments in India all subsidise biogas plants of approved designs. SKGS administers the process of claiming subsidy, which is paid when the plant has been approved by a government inspector and is typically 60% of the total cost. Customers usually pay the remaining 40% in kind by providing sand, gravel and bricks for the construction, taking part in the construction and providing food for the construction workers. 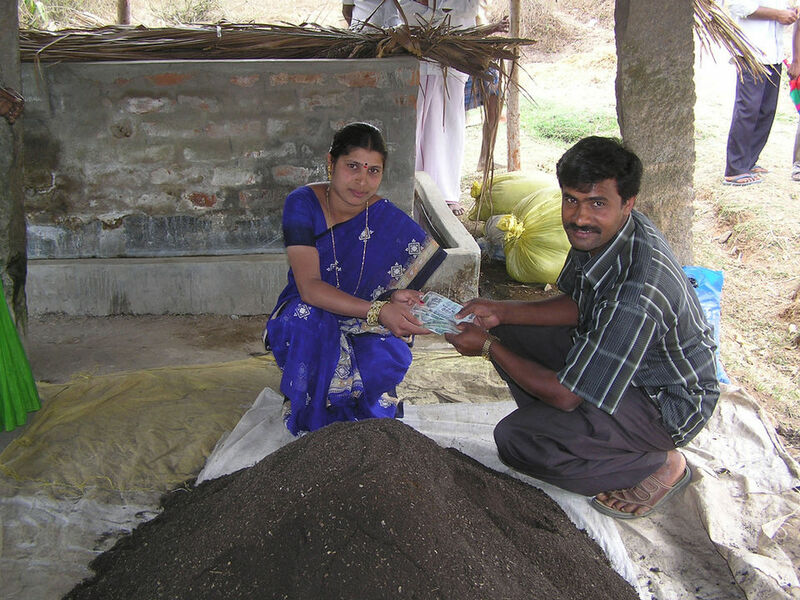 The vermicomposting system adds an additional US$260 (Rs 11,180) to the cost of a plant. Biogas can be used for cooking. 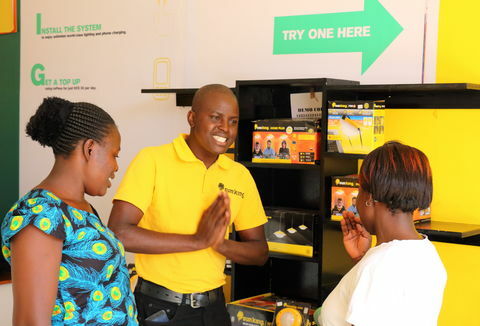 When a customer orders a biogas plant, an SKGS technician co-ordinates the work, arranges for materials to be delivered, organises training for the owners and checks the quality of the construction. The supervisor for that area will help the new user to become familiar with the plant operation, providing each with a maintenance manual. SKGS employs supervisors and masons from the local area to do the installation, which is essential to ensure the long-term reliability of the digesters. New recruits are often unemployed young people from families with biogas plants, so they come with practical experience of plant operation. They initially help the trained masons in their work, until they have sufficient experience to work independently. Both men and women are trained as maintenance technicians. SKGS emphasises high quality installation, and guarantees its plants for five years. Each plant has a unique serial number, which is recorded electronically and on paper at the local and central offices. Plants are visited regularly to check their performance. The oldest plants have operated for over 14 years and are expected to last for at least another 10 years. Only about 1% of plants fail to work well. The digester vessel is built by excavating a large hole, laying a concrete floor, and constructing a dome of bricks. A gas pipe made of galvanized steel is held in place in the centre of the digester dome, and takes the gas to the biogas stove in the kitchen through a HDPE pipe. The feedstock is mainly cow manure mixed with an equal amount of water (some of which is kitchen wastewater). The manure contains the methane producing bacteria which digest the organic material. Other organic waste such as residues from silk worm farms can also be added. The feedstock is collected in an inlet tank at ground level, and flows under gravity into the digester vessel. As the feedstock flows in, an equal volume of digested residue is displaced into a ground level reservoir at the outlet. All materials used are available locally, except for the gas burners and HDPE piping which come from elsewhere in India. It is important that the bacteria have sufficient time to break down the feedstock, and the size of a digester is chosen so that the decomposing organic matter (slurry) is held for an average of 40 days. SKGS makes models with 2, 3 and 4m3 /day gas production capacity, to process from 50 to 100 kg of manure per day (equivalent to two to six cows). The residue can be used directly as an organic fertiliser on nearby land, but it is too wet and bulky to transport far. SKGS encourages users to process the residue using vermicomposting (worms) and make a better quality fertiliser in a suitable form to sell. This processing takes place in a purposebuilt unit adjacent to the biogas plant. Mrs Munithayamamma mixing biogas slurry to make high quality fertiliser in Hermarlahalla village. The plant was supplied by SKG Sangha. From 1993 to 2007, SKG Sangha built and supplied over 43,000 biogas plants in rural Karnataka, benefiting over 210,000 people. 85 of these plants had vermicomposting units. A family in rural Karnataka uses an average of 3.5 tonnes/year of fuelwood to cook on a traditional stove, and a biogas digester replaces all this wood. Because the production of fuelwood is increasingly unsustainable, the use of biogas reduces deforestation and associated greenhouse gas emissions. It also reduces the emission of methane – a more potent greenhouse gas – from manure heaps. An average biogas digester saves an estimated 4 tonnes/year CO2 equivalent, so the total saving from 43,000 plants is about 170,000 tonnes/year CO2 equivalent. 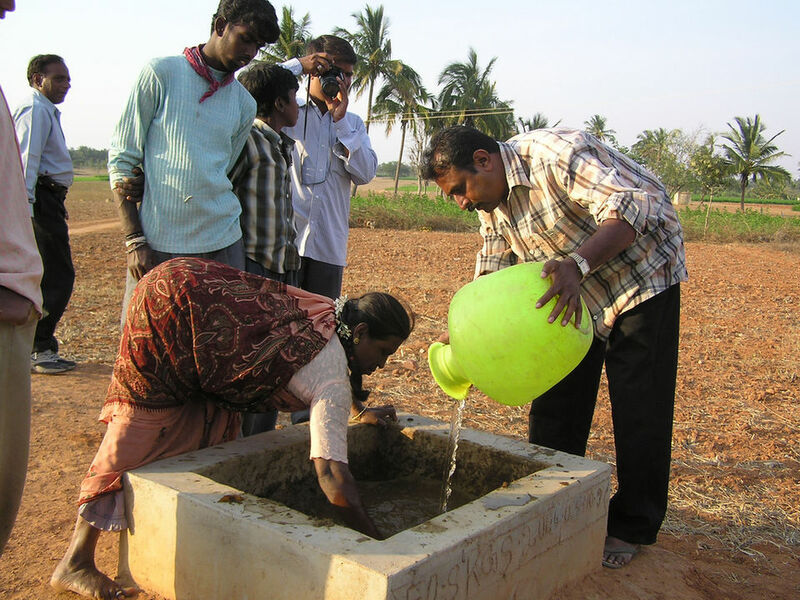 One of the most important benefits that biogas brings to villagers in Karnataka is more time. Two to three hours per day that were previously used to collect wood and to cook are released for other purposes. Because the biogas can be lit and used immediately, hot food can be prepared in the morning and children can eat before they go to school. 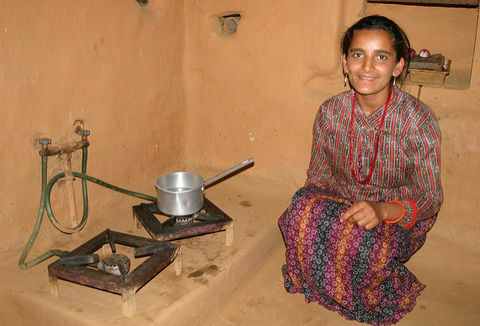 Families with sufficient biogas may also use it for lighting. Cooking with biogas instead of wood brings significant health benefits, especially for women. The reduction in smoke and soot reduces the incidence of respiratory complaints, eye problems and headaches. Cooking pots are easier to clean and the house does not become so dirty. In addition, easy disposal of kitchen waste and animal manure into the biodigester means that the whole village is now cleaner. The output residue from a biogas plant can be used directly on nearby land as a fertiliser. SKGS has enabled biogas owners to produce a better quality and saleable fertiliser from the residue, by including vermicomposting units with biogas plants. In these, the biogas residue is mixed with fibrous material such as straw and leaves and allowed to compost for 25 days with frequent turnings. The bacteria in the residue accelerate the composting process. Worms are then added to the top of the mixture, and covered by leaves or straw and a jute mat to keep them moist and dark. Each day, the top layer of worm casts are scraped off and stored for use as vermicompost. A small amount of water is added daily to the mixture, and the ‘vermi-wash’ liquor that drains through is used as a plant feed and to suppress insect pests. The vermicompost improves the quality of family crops and reduces the use of inorganic fertiliser. SKGS is working with the Agricultural University of Bangalore to independently test the value of the fertiliser, but reports from users are very positive. In addition, women can earn about US$280 (Rs 12,000) per year from selling about half the vermicompost that they produce, which nearly doubles the family income. 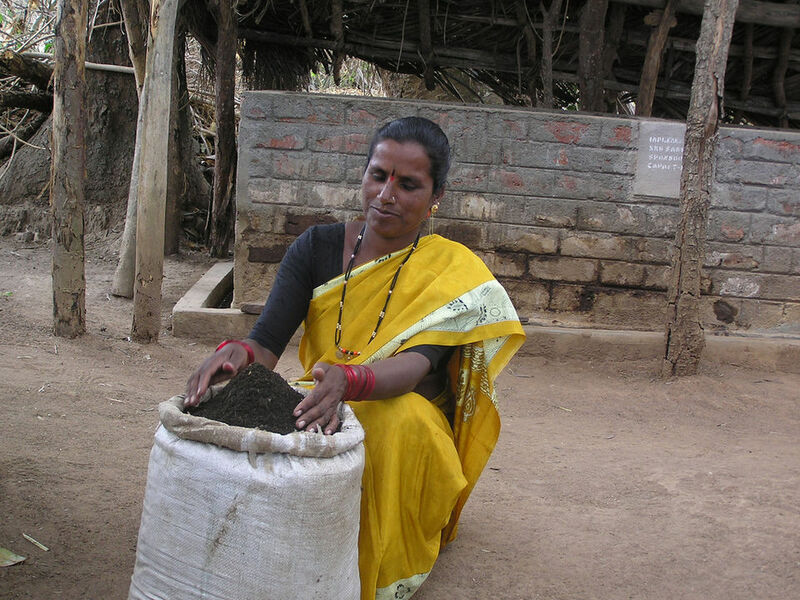 Mrs Rukimini selling vermicompost, produced in a unit installed by SKG Sangha in Siradhanahalli village, near Bangalore. Vermicompost is made by mixing biogas slurry with leaves and straw and then adding worms! The demand for biogas systems is very high in rural Karnataka. The demand for biogas systems is very high in rural Karnataka. The main bottleneck is the availability of funding, since the capital cost of a plant is too high for most rural families, and the government subsidy is being phased out. Anaerobic digestion is well established across India and other countries in the region, but vermicomposting is not. Vermicomposting units could be added to village biogas plants of any design, with considerable benefit in producing better quality fertiliser and a saleable product. There is growing demand for such organic fertiliser in India. SKG Sangha has grown rapidly since winning a 2007 Ashden Award. Much of this growth has been achieved because of carbon finance, which is particularly useful since the government subsidies previously available for biogas plants are now being reduced. The greenhouse gas avoided by SKG Sangha biogas plants has been formally assessed using two different CDM methodologies at 2.78 and 6.18 tonnes/year CO2 equivalent. The higher value takes into account the prevention of methane emission from manure heaps, as well as the replacement of mainly non-renewable biomass and also kerosene for cooking. 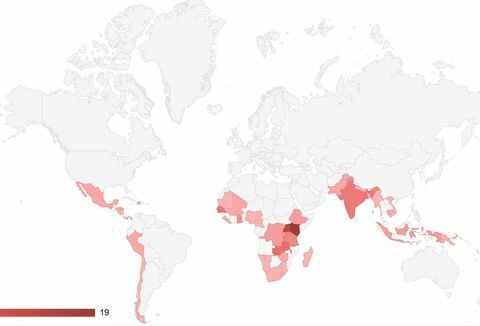 Since 2007, SKG Sangha has installed a further 38,300 biogas plants in India, bringing the total to over 81,000, with pilot schemes in Kenya, Ghana and Uganda. The plants bring benefits to half a million people, with a target over the next five years to reach 40,000 new families every year. New products related to biogas plants - pressure regulators and high efficient biogas burners – have also been developed and 5,000 and 3,000 of each supplied respectively. 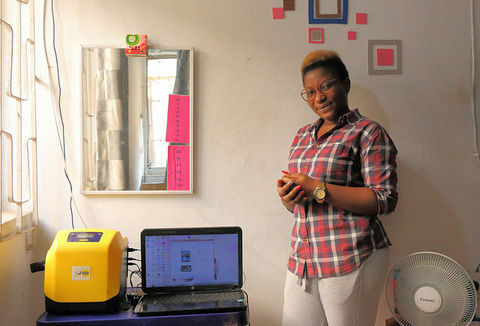 Most of the money from the Ashden Award has been put into a fund to set up a residential training centre for women to learn the construction and maintenance of biogas plants.